Comments: I was a bit concerned about this colorway - the combo of blue and orange has never really appealed to me, regardless of what the colorwheel says should be true. I decided to split my first 4 oz bump into two color groups and spin them seperately. 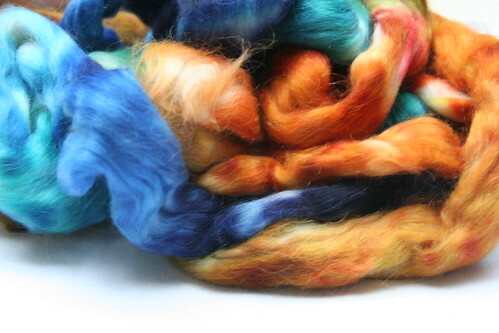 Here's what the fiber looked like originally. I broke the top apart into blue/green chunks and orange/olive chunks. Each piece was stripped into 4 lengths and I tried to mix them up as much as possible in the spinning. 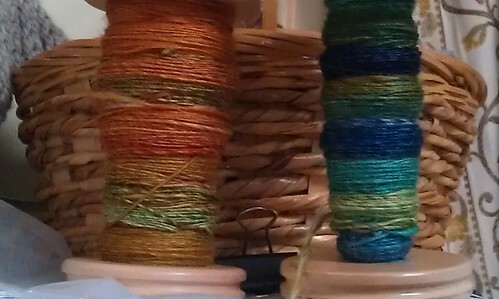 Here is the first batch of finished singles before plying. I spun this with a short forward worsted draw, and the singles ended up a bit thicker then my usual default yarn - the mohair seemed a bit clumpy, more like tencel then wool I think. But really fun to spin, and so smooth and drapey - I knew the finished yarn was going to be incredible. 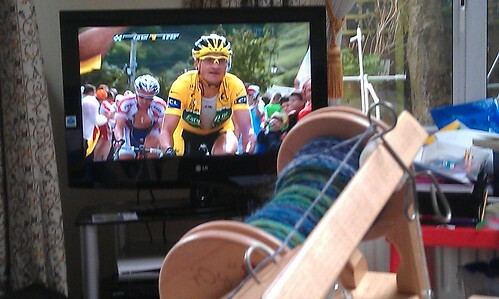 Originally I was going to split the second four ounces down the middle and spin for matching chain-plied stripey socks. However. Once the first two skeins came out of their spa treatment, I started thinking that I needed to do the same with the second bump. So when the cyclists hit the Alpes, I was spinning away on another orange vs. blue situation. 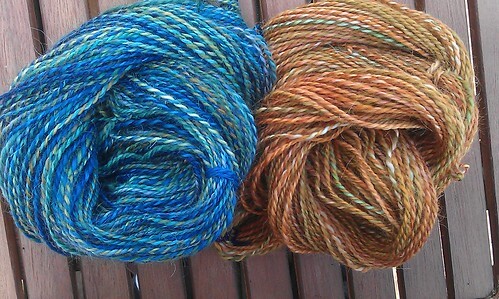 I ended up with about 220 yds of blue and 150 yds of orange, approximately DK weight. Now I just have to find the right pattern for them! 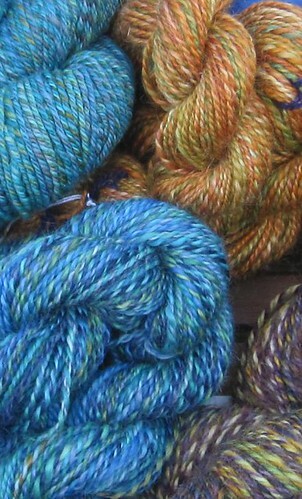 Written by porpoise On July 29, 2011 In "Tour de Fleece", "fiber club", "spinning", "stash"